Contacts may be made on any amateur radio band or mode (no repeater/digipeater contacts). A confirmation must be presented for each of the 58 counties. Automatic confirmation will be granted for QSO's made in the California QSO party from 2006 onward provided the QSO station submitted a log. QSL cards may be submitted for any remaining QSO's. Each confirmation must have the county indicated. Portable and mobile units may be worked for credit. The award will be endorsed by band and mode if desired and qualified. 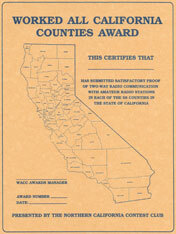 Membership in the Northern California Contest Club is not required. You may submit either a computer-generated printout in lieu of hand-writing the claimed QSO's on the form, or a Cabrillo-format file via diskette or CD. In both cases, the identification information at the bottom of the form must be included with the application.